I wasn't even thinking of anything from The Clone Wars, being that I'm still in my first year of collecting the line. They've done it with G.I. JOE characters multiple times, though. "There are no plans at this time," doesn't necessarily mean a figure isn't in the works. It may be true that a character isn't planned when they say it, but sometimes it's only true from a certain point of view. 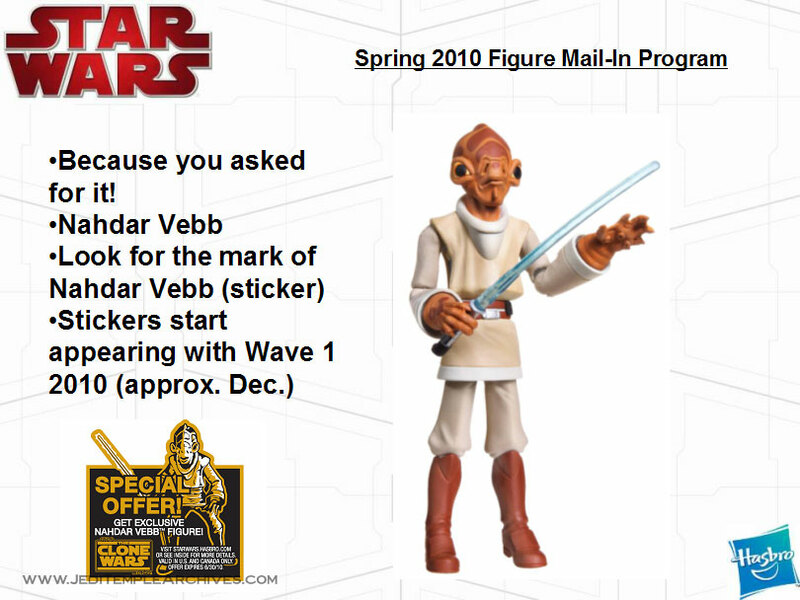 Question: Will we see a figure of the Clone Wars Mon Calamari Jedi, Nahdarr Vebb? ANSWER: There is no Nahdarr Vebb figure planned. I love Nahdar...he was a fiesty one. Yeah, that's pretty much identical to the situations I was describing. I was glad to see him go. He wasn't worth the Jedi title. Someone is very judgmental when it comes to Jedi. Like a Wookiee, I'd like to pull his arms right out of their sockets. Question: What is the status of any upcoming Jedi spirit figures? Yoda is way overdue and we could also use a new Obi-Wan as well as a Qui-Gon based on his appearance in season 3 of The Clone Wars. Also on the topic of Jedi ghosts, do you plan on ever making a new Anakin that is sculpted to look like the original actor Sebastian Shaw? It would be nice to finally have an update to this classic Kenner figure. If you are considering a Shaw Anakin, please think about including an alternate grey cloak so he can also be displayed in his Kenner colors? ANSWER: There are no plans for additional Jedi spirit figures or ghosts. ...a Qui-Gon based on his appearance in season 3 of The Clone Wars. I wouldn't want any portion of the tooling budget allocated to such an endeavor. I, too, have little interest in seeing Hasbro make this figure. But, I wouldn't mind having it if they did *not* make him look like a ghost. That way, I could pretend that the figure was just an animated version of the Qui-Gon we saw in The Phantom Menace. Question: Thank you for seeing fit to include the 2009 Aayla Secura in the 2012 Clone Wars line-up. Her figure has been very difficult to find since it was first released so many of us will welcome a second chance to track her down in stores next year. That said, is there any chance you might take this opportunity to improve her facial paint aps please? The sample shown at events in the year of her release (and even afterwards) was a gorgeous figure with a great likeness, but the version that actually hit retail was very different and left something to be desired. I would think you'd agree she bears far less resemblance to the character from the show than the prototype and is, well, somewhat less pretty. It looks so different I can't help wondering if it was even the same face sculpt? If so, it is amazing what a difference paint aps can make. Any chance we will see a fix with this release please? ANSWER: We are working with our production team to try and improve the paint ops. That would be fantastic if they were to produce other characters from the movies in the animated style. Otherwise, I wouldn't be terribly interested. Question: Are any of the following characters on tap for the Clone Wars line: OOM-224, Republic Gunship pilot Hawk, Wat Tambor, Nute Gunray, and generic gunship pilots? ANSWER: None of these are in the Clone Wars figure lineup right now. ANSWER: It's unlikely that many of these figures will ever be released on a basic card. The Clone Wars figures have virtually no chance, since we have moved on from those episodes to those drawn from new seasons and those are unlikely to be revisited. The Saga (movie) figures have a better chance since we have yet to release an AT-ST or Rebel Trooper on an update Vintage card and these are both good choices (although the latter could be any of several figures, including the bearded trooper, or a new quilted vest trooper....a good problem to have!). As for the Snowtrooper, it's unlikely he'll be re-released on Vintage for now. Thanks for the heads-up on the apparent shrinkage issue. We have not heard that one, but will look into it. It may have been re-tooled at our factory which resulted in some changes we had not noticed. It has been a very popular figure between the original release, Saga Legends, and various other multi-figure packs so this looks likely. Thanks for the heads-up.